At first, the game may seem like a walk in the park, with little to do besides jumping across gaps while collecting dots and transforming to pass through lattices. Make it through the first few stages though, and things start to heat up. 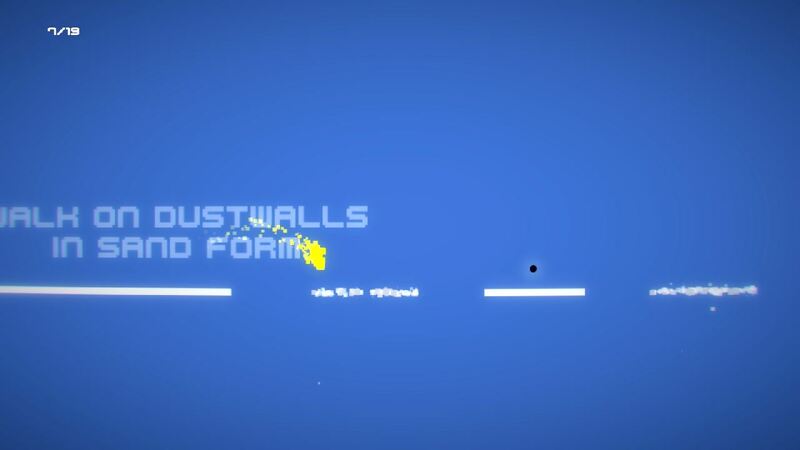 Dots that can only be collected in sand form, dustwalls that won’t let you pass unless you’re solid, oh and… spikes. Because everybody loves spikes, right? Or how about having to time sand/solid forms in order to slip through a solid platform and then a second later, do the opposite wish one made of dust? Told you it gets tricky as you progress through the levels, and here’s a fun fact: No checkpoints! Each of the 18 levels are unlocked in succession, so if you’re stuck on level 5 there’ll be no level 6 for you, and so on. Thankfully, you can (re)play unlocked levels from the main menu, where you can also see which still haven’t been perfected. Good for those who strive for perfection in their games. Me, I’d be satisfied with actually making it through them all, dots be damned. Aside from me being terrible at it, Spectacular Sandman is actually quite a fun little game, even if the difficulty might be too much for some people. Head on over to the official website to grab either the Windows, Mac or Linux version. Or, try the 3-level webdemo in your browser (requires Unity). I’d recommend a gamepad, but it’s not a necessity.